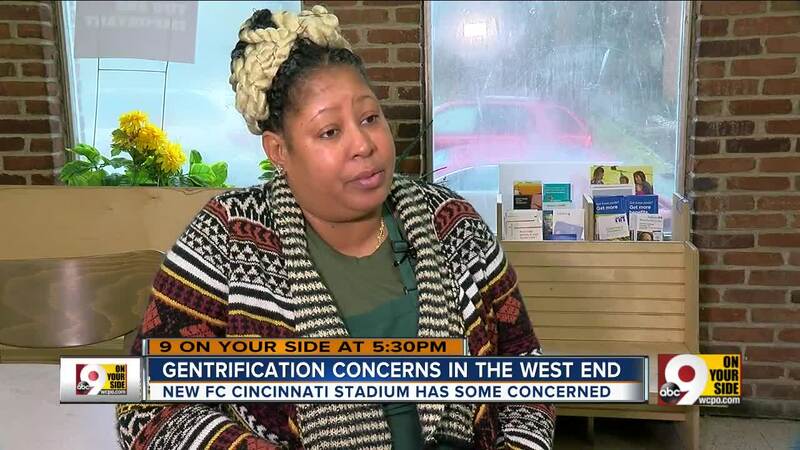 Development related to the new FC Cincinnati stadium has some residents concerned. CINCINNATI — Up until a few months ago, Just Cookin' was a busy business in the West End. Owner Monica Williams took pride in the fact that she filled a need in her neighborhood. "It just meant so much to be able to be down here, be in a community I was born and raised in and to serve my people," Williams said. "You can't go in (to most restaurants) and say, 'I don't get paid today. Can I get a meal and pay you Friday?'" Now, Williams' leased space in the West End will be torn down as part of the FC Cincinnati stadium project. "When I first started Just Cookin', it was all me," she said. "I never knocked on a city door and asked for help and never asked for anything from anybody. But this time, it can't be all me." Williams' situation is an example of what has caused uneasiness for many West End residents. They are concerned about gentrification. "The fears are still really close to families," said Alexis Kidd, executive director of Seven Hills Neighborhood Houses. "Even individuals that showed up to meetings that don't even live in the West End anymore, but they were displaced. Their families were displaced many years ago." For many who remember, it's seems like deja vu. During the late 1950s, thousands of African-Americans living in the West End were forced to leave because of a plan by the City of Cincinnati to create an industrial area that is currently Queensgate. Williams and others in the West End said they want to see new development in their neighborhood, as long as legacy residents are protected. "We really want to support residents and say, 'OK. If (FC Cincinnati) is coming and it could be a good thing for our community," Kidd said. "So, let's look at ways and examine how this could be something that can really work for us." Seven Hills Neighborhood Houses is working with The Port to help residents through a memorandum of understanding signed last October. Port officials say they normally don't sign MOUs with neighborhoods, but felt it was needed in this case. "It's kind of saying on the public finance side, we're not going to do the public finance unless we have some other stopgaps in place to help with the neighborhood piece of this," said Jessica Powell, vice president of the Hamilton County Landbank at The Port. "What happens when a neighborhood changes, and people who were previously allowed to use their voucher are no longer able to because the landlord wants a rent that's double the amount?" said Powell. Through bonds and a lease agreement, The Port will own the stadium. The Port also owns 50 properties in the West End. They have agreed not to sell the majority of them until recommendations are received from a housing study. "That could be everything from potentially requiring landlords down here to accept Section 8 rental vouchers," said Powell. The $100,000 cost of the study is being paid by FC Cincinnati. It is expected to be completed in June. Powell said The Port expects to spend more than $1 million this year on stabilizing vacant properties they own. There is also a fund in place to address housing needs of low and moderate income West End residents. FC Cincinnati is also placing $100,000 into that fund. Residents may be able to begin applying for help through the program this month. However, privately-owned properties are a challenge. For example, The Arts Apartments complex on Ezzard Charles Drive is being sold. Now residents fear rents will go up. But, Seven Hills Neighborhood Houses is working with the prospective new owners. "We've got meetings with the next owners of The Arts Apartments," said Kidd. "We're talking about partnerships with them." At the same time, many home owners in the West End have received letters and been approached by investors offering to buy their homes. "There are people that are scared and saying, 'OK, I can get $15,000 for my house,'" said Kidd. "But explain to someone that your house is worth more than $15,000. Don't sell out so quickly." Meanwhile, Seven Hills Neighborhood Houses is trying to work with Williams to find a new location for her catering business. Williams really wants to stay in the West End. "Are we going to continue to do business in the West End? I don't know what the future holds for me," she said.